More Volume Using Two Amps? Topic: More Volume Using Two Amps? 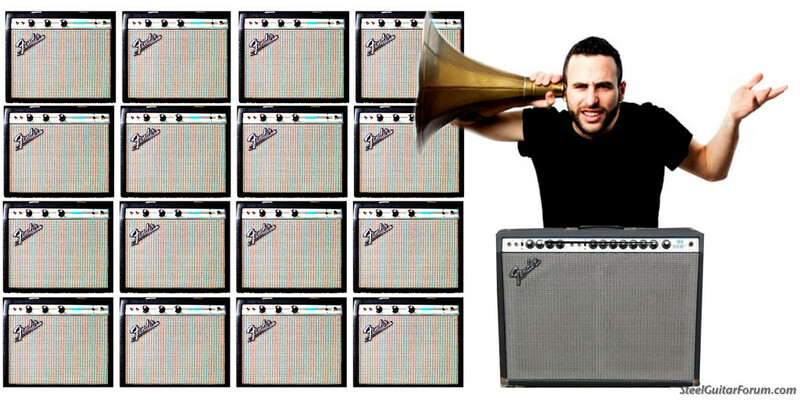 Playing through 2 identical amps with identical settings is in no way twice as loud as playing through 1. But there is still a question in my mind about what difference in perceived volume you might have a realistic right to expect. Recently I read somewhere that a 3db increase equates to something like double the power. 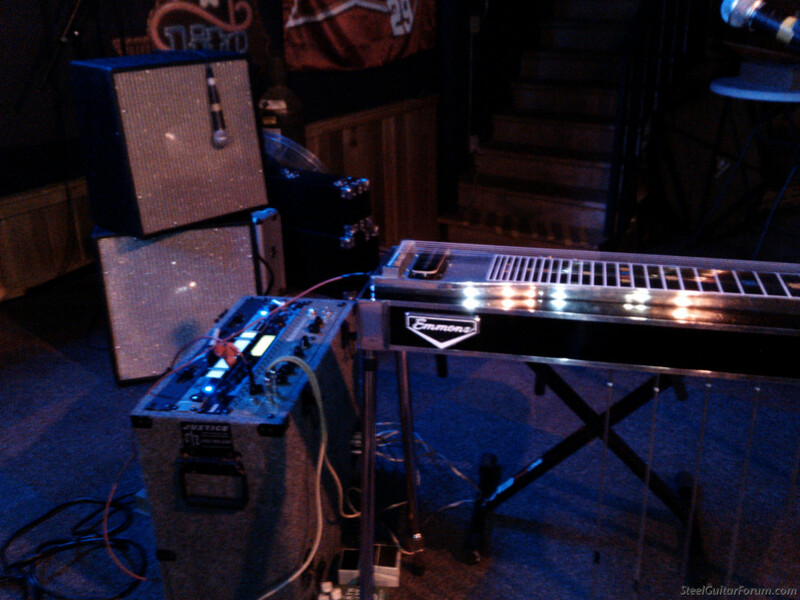 So lets say hypothetically you have 2 Peavey 112's (I do not – this really is hypothetical) and last night you only took 1 to the gig and it did not quite cut it volume wise. You had trouble keeping up at times AND you have completely ruled out all options like getting a quieter drummer, getting the guitar player to turn down, convincing the bass player to play the right style, waking up the sound guy, putting a hit on anyone, or using your time machine to go back to 1965. Now also say that for some reason you are happy enough with this gig (remember – hypothetical) and you decide that tonight you will bring your second Peavey 112. Sorry – also assume that there is no phase or hum issue with your set up. It's plug and play time. At last the question: What difference can you realistically expect? My opinion is that the result will be something like ~+3db between the extra power and improved dispersion assuming you can place the 2 amps correctly to achieve that. So what do you think? I'm sure more than a few of you have tried something like this. I have – although never through 2 identical amps. It just seemed to me that the 3db = double the power thing is probably about right. Thanks for hanging in there and reading this far! Twice the power, or two identical amps side by side, equals about 3 db louder than one amp of a given power. That is a barely audible increase. Four times the power, or four identical amps side by side, equals about 6 db loader = twice as loud as one amp of a given power. Thanks Georg. It's interesting to me that the improved dispersion can mean as much or more than a small increase in perceived volume. You could conceivably end up turning down and keeping up just fine in this hypothetical scenario. I like the sound of 2 amps to spread out the sound and allow for the use of stereo effects to fatten up the sound in the near field. Depending on where you're listening at, and the frequencies involved, the sound can be louder or softer depending on phase cancellations. Using two amps or a rack system with two bottoms gives you that semi small wall of sound. I've used two PV' s with a ProFex and now use a Stereo Steel with two bottoms and the sound is incredible from the small wall of sound. 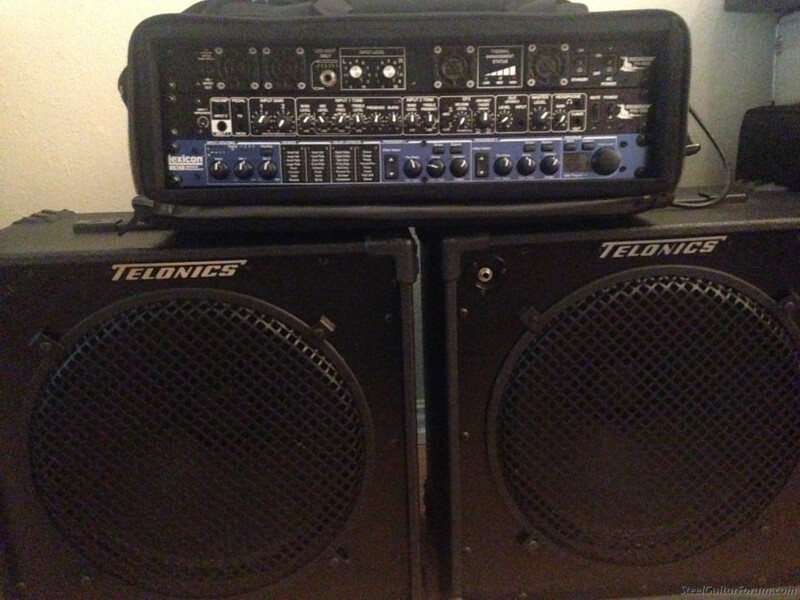 Also, using two amps, you can adjust the tone of one amp from the other, i.e. More bass on one and more highs on the other or just keep them the same. I have the same rig as Ken. I separate the speakers because I like stereo reverb, and I can always point one at myself if it's a noisy band. I used to use a pair of Fender 112s and the dispersal definitely helped. How can that be George? Once the sound is produced by the speaker there is nothing else to amplify that sound. I think that Different positions in the room may hear the dispersion of the sound differently depending on their position from the generated sound and it may sound louder to the listener. But a fixed level meter should read the same with one or two amps. An acoustician will tell you that TWICE as loud is 10 db, not 6db.YMMV. Perfectly in-phase signals from two or more speakers (that carry the same signal) get added – amplify each other, while 180 degree out-of-phase signals from speakers gets subtracted – dampen each other to the point of canceling each other out. Then you have all the in-between situations caused by placements of individual speakers in relation to each others and the "receiver" (listener or microphone), where the audible signals goes in and out of phase depending on frequency. Easier to measure with some accuracy than to hear, because our ears are separated by our heads and receive phase, volume and eventual reflexes and dampening factors different than a one-point microphone. May "sound" right, but when measured it isn't … see above. Our brains aren't bad at adding and subtracting sounds based on phase either, but the fact that we have two "separated receivers" can mess things up a bit in our understanding of what we actually hear. The first term is 10 log( 4 ) = 6 dB. The second term is the sound intensity level from one violin. Now, when two violins play together, the total intensity is 2 x 10-6 W/m2. NOTE: WE DO NOT ADD THE SOUND LEVELS FROM THE TWO VIOLINS PLAYING SEPARATELY!!! This would make no sense if we did add the sound levels, since we would conclude that two violins playing would produce a level of 120 dB, equal to the loudness of a nearby jet engine! If you were moving backwards at the speed of sound, could you be heard? Also, if you were driving backwards at night at the speed of light and turned on your headlights, could you see where you've been? If you were moving backwards at the speed of sound, could you be heard? Most definitely. You'll create a sonic boom, regardless of direction. Also, if you were driving backwards at night at the speed of light and turned on your headlights, could you see where you've been? I think the confusion around the dB value that represents a doubling of acoustic amplitude to due to the fact that although the loss of amplitude per meter is 6 dB for a spherical wave, it is 3 dB for a planar wave. So in most cases, 6B is closer to the mark. However the sophisticated speaker systems for bands playing huge venues can project planar waves. So they can come closer to 3 dB loss per meter. If you manage that you effectively double the amplitude of a single wave (which is even possible using only twice the power). However, that is not easy to do unless you have speaker systems with huge footprints that can project planar waves. If you look at the chart in the link George provided, look at the right hand column called "Amplitude ratio" and find "1.995 ~2". That means twice the amplitude. To the left on that row you can see that 6 dB is the decibel value that represents a factor of approximately 2 increase. If you haul in and set up twelve 15 inch speakers behind you and can somehow get the resistance down to 4ohms and use one 200w amp to power it, the rest of the band will complain that their pants legs are fluttering and you're too loud. Interesting trip thread into the twilight zone. I would think that time aligning the amps/speakers to the listener would count for hearing both in any given space. Take into consideration that normal in concert work, the farther the listener is from the stage and the FOH hanging on both sides of said stage, the time it takes for the sound to arrive at the listener is not the same for those standing directly in front of the stage. Hence speakers and their associated amps would have to be set for a time delay the farther your ears are from the stage. I assume we are talking about audible changes in volume and not just a math calculation. Since humans hear as part of the ability to survive, echoes, reverberations, sounds coming from low to the ground and up above our heads, phase cancellations occur as a normal consequence. The better one's hearing is, the better one can hear these cancellations. And the better trained that person is in hearing phase anomalies, as in being a sound engineer, musician, then the ability to hear volume changes will be more acute. With industrial noise pollution, living in a noisy city, people become deaf to many sounds. Cars passing by, lawn mowers, the hum of your refrigerator/air conditioner. Hence we should add into this thread's equation that the ability to hear by any one listener should weigh in. I think Greg's comment captures the idea. 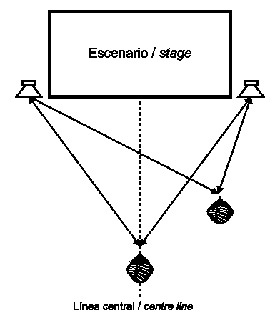 Reiterating a post I made on a different thread, in a concert setting, sitting in front of FOH typically being two sets of speakers with two sets of amps/xovers, the sound person at the board in the middle of the stage between the two arrays (as is SOP these days) at the back of the venue, will be sprayed with a power alley. Depending on how and when certain frequencies, mostly low because high frequencies don't fare well at travelling unlike lows that zoom around, arrive at the listener's ears, it will be a crap shoot if said frequencies will arrive IN PHASE and AT THE SAME TIME. If not, we get comb filtering and a human which is the listening device will not hear certain frequencies to be able to perceive volume as we were designed to use our senses for survival of a predator coming at us, to tell size and direction, above our heads and below. Listening to music is last on the list for the proper use of our ears. The red fingers or "lobes": The areas between the lobes of frequencies, in this case let's say 100hz, represent cancellation. Level readings show levels down 20 dB from the lobes. At a concert, sometimes the kick drum disappears depending on where one is out in front of the stage. All that said, there is an actual push by a company that features Mike Einziger, the guitarist in the band Incubus, as well as Rick Rubin, producer par excellence, songwriter/rapper Pharrel Williams and our favorite billionaire to the stars, Elon Musk, that has developed a concert listening app called MIXhalo that allows your smart phone to jack into the FOH's system at a concert and through ear buds, you will hear the concert without the hampering of phase anomalies presented in a 10,000 seat arena. "Clearly, in this case he can hear everyone else, and nobody else is listening to him. All he needs is to be able to hear himself well enough not to feel lost. Elevating the amp and taking advantage of its pattern would be my own first move, raising it nearer to ear level and aiming it at the player." Sometimes the simple solutions are good! For a very much "less scientific" perspective here. In the late 70s, when Stevie Vaughn used to play the bar scene, he traveled in a truck full of Cezar Diaz modded Vibroverbs (some 1x15, some 2x12 - or 10 I can't remember). We saw him in a very small club in Charlotte a bunch of different times. Usually, he had one of the verbs right behind him but sometimes he'd run two - one behind him, and one on the other side of the stage between the bass and drummer. These said verbs were - I mean! - loud! I remember him ALWAYS being loud, no matter what the arraignment was, but when he had the two of them going, it wasn't necessarily that he was louder (I'm not sure that was possible haha) but whole lot more present - If that makes any sense. Either way, if you stayed all night, you weren't going to hear right for a couple days. he traveled in a truck full of Cezar Diaz modded Vibroverbs if you stayed all night, you weren't going to hear right for a couple days. SRV was out there when it came to gear. Had a fetish for the number "6" and would set levels to that. Diaz unscrewed the amps and set the knobs so that they would read "6"
but actually be on "10." His last album with DT, In Step, SRV brought over 30 amps into the studio. 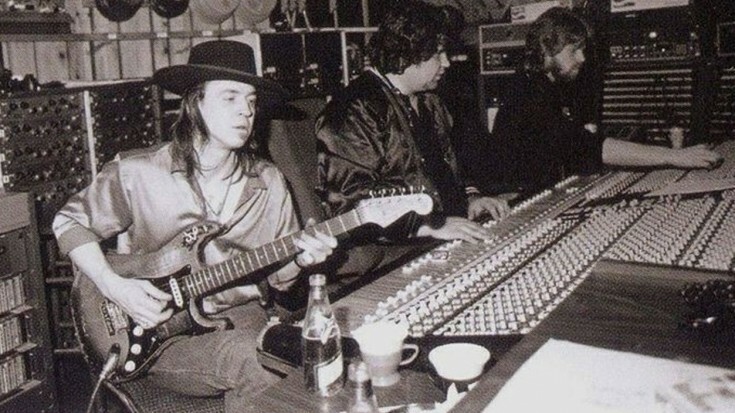 I read somewhere, can't remember where, that one session SRV had like 60 amps going at the same time and was able to tell in the headphones which amp was not acting the way he wanted. Hmm. This reminds me of something I've often wondered about boats that have two outboard motors instead of one. Godfrey, That guy was the most single minded person I ever talked to. I was 18, and thought I was eat up with guitar/music. After he'd fill me in on all the things I was capable of taking in at that point, he'd go on and on way down the road till my eyes were spinning and there was a hum in my ears haha! He'd get the briefcase out, and show me all the new designs him, Billy Gibbons and Johnny Winter were working on. I seriously think that all other things in life (at least at that point, 1978 or so) were peripherals that he had to put up with in his quest for guitar/music... all things aural. I also believe that this was the key to his greatness: If anyone has ever done it, it's not easy to stay interesting for 4 hrs at a time in a 3 piece guitar band - and no one did it better than him - except maybe Hendrix. - Sorry for getting off topic, but this kind of talks to the 60 amplifier thing, and his obsessions. I was 18, and thought I was eat up with guitar/music. After he'd fill me in on all the things I was capable of taking in at that point, he'd go on and on way down the road till my eyes were spinning and there was a hum in my ears haha! He'd get the briefcase out, and show me all the new designs him, Billy Gibbons and Johnny Winter were working on. I seriously think that all other things in life (at least at that point, 1978 or so) were peripherals that he had to put up with in his quest for guitar/music... all things aural. I also believe that this was the key to his greatness: If anyone has ever done it, it's not easy to stay interesting for 4 hrs at a time in a 3 piece guitar band - and no one did it better than him - except maybe Hendrix. - Sorry for getting off topic, but this kind of talks to the 60 amplifier thing, and his obsessions. Bobby, well said and what an experience to brush up against someone like SRV and when you were a teen! Some critics would paint SRV "derivative" but what a joy his soul and essence brought to this planet! You got your mind blown when he was inspired by you to tell you of his projects. I can just imagine what it felt like to try and hang onto what he said. Layers and layers of "really?" Like it has been said, that if a human were to meet an intelligent alien, the human would have a hard time differentiating that intelligence from "god." I agree, Stevie really put on a show and filled space and time admirably! Tommy I think you partially hit your answer. Perceived volume is in your head, your mind can only tell a limited amount of volume and everyone's sensitivity to volume is different. More watts will increase sound pressure level, but an increase in sound pressure is not necessarily double the volume. From a psycho-acousticians' POV, volume or loudness is subjective. It can be measured with a meter and calculated with a formula but hearing it is where it counts. The level you perceive as twice as loud, it is not at +3dB, which is twice the power. It is normally more than +6dB (4 times the power) or +10db (10 times the power). Then the cost and transport issue of 16 Champs vs one Twin is another matter.